Sunday night found the Brooklyn’s Galapagos Art Space the scene for a mini-marathon of new music focusing on performances with electronics. The duo Loud Objects started the night with a piece that was equal parts improvised sound experiment, light installation and free-wheeling soldering session. 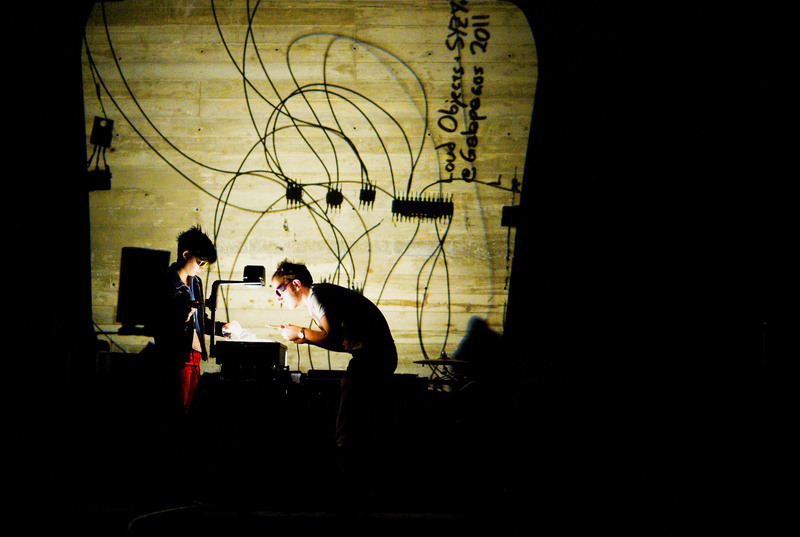 The performance began by the duo silently placing electronic parts on an “antique projector.” After the initial circuit was created, an abrasive, yet captivating, sound filled the room. Seeing the process being projected onto the wall drew the audience into the piece: “How’d such small things that were totally inactive a minute ago, start producing such a loud sound? And how does adding that one wire there change the sound from BABABABABABA to TWEEEEEEEEEEEEE?” Loud Objects somehow found a way to make their set just loud enough to be on the threshold of uncomfortably too loud, and just long enough to show off what they could do without going too long. After they tore down all their electronic gizmos and do-dads, Syzygy New Music Ensemble started their set with Danielle Schwob’s Mehr Licht. 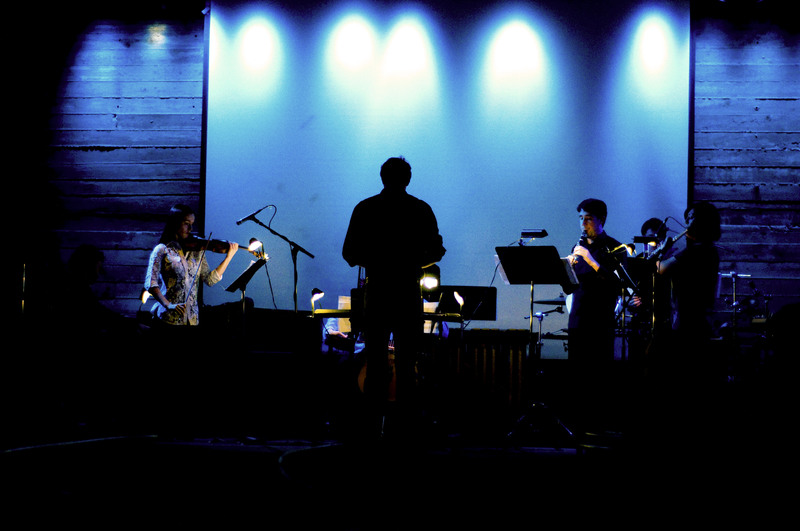 Meaning “More Light” in German, the piece employed a medium-sized chamber ensemble and electronics. I kept going back and forthwith myself on whether the electronics were necessary, or all the musicians were necessary. With the number of players on stage, Schwob could have gotten acoustic sounds just as interesting and beautiful as the electronic part. Rapture by Anna Clyne was the first “karaoke” piece of the night. Written for solo Clarinet with live and pre-recorded electronics, with live digital visuals by Joshua Ott, the piece seemed to play itself. The most interesting part of the piece was Ott’s live visuals. They oozed and morphed on the screen in tight conjunction with the music. Tristan Perich’s Observations was so engrossing all I could write down during it was “Robot Crotales Players.” The piece did an excellent job keeping one tiny idea interesting. Percussionists Frank Tyl and Sean Statser were machine-like in their focus and dedication to the performance. The last two pieces before the second intermission (I mentioned it was a mini-marathon), were vastly different. Nico Muhly’s Honest Music for Violin and pre-recorded electronics had twinges of bad movie music, while Mason Bates’ Red River told the story of the Colorado River. The piece had isolated moments of brilliant gestures and ensemble writing, but it also had long stretches of cliché harmonies and uninteresting sounds. Because of the late start the concert got, and because I had to be responsible the next day, I had to leave after the second intermission. Overall, the concert was interesting. Some would argue it as a showcase for what role electronics could play in concert music, and some would argue it as an example of electronics becoming stale. I could see both and would argue both. The moments that interested me the most were the moments when electronic sound and acoustic sound became one, when I couldn’t figure out what timber the sound was, or who (or what) was making it. Note from Nouveau Classical Project: we will be performing Schwob’s Mehr Licht at our concert on March 10 for MATA Interval 4.3: Amped/Electrified! You can pick up tickets here.